How Bangladesh cracks down on workers that protest horrible factory conditions. The Conditions at Bangladeshi Apparel Factories Are Still Horrible. What Happens to Workers Who Speak Up Might Be Worse. 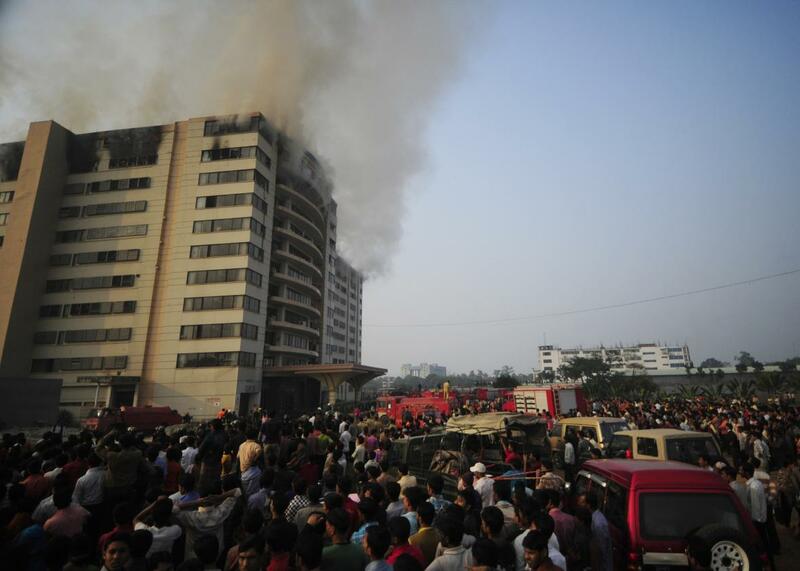 A 2010 fire at the Hamim Group garment factory in Ashulia, Bangladesh, which made clothes for brands including the Gap. At least 24 garment workers and labor leaders in Bangladesh remain in police custody without bail Friday, more than a month after being arrested during a spontaneous wave of walkouts by thousands of workers at factories in the industrial hub of Ashulia. The protests began at a factory called Windy Apparels, which makes clothes for Swedish clothing giant H&M and British retailer Tesco. I visited Ashulia in late October for the Nation Institute Investigative Fund and Slate, and wrote about the death of a 23-year-old seamstress at Windy Apparels, Taslima Akter, who collapsed on the factory floor after being denied sick leave for weeks. Less than two months later, the factory where she worked has become the epicenter of the country’s largest wage protests in years. On Dec. 11, about two dozen workers at Windy walked off the job, after factory management refused to address concerns they had been raising since Taslima’s death. Their primary demand was for an increase in the monthly minimum wage of $67 to roughly $200—a figure closer to a living wage in a country where the minimum wage has failed to keep pace with rapidly rising inflation. Labor advocates told me that their demands also included a stop to the arbitrary abuse and firing of workers, six months of paid maternity leave, and, to prevent a recurrence of a death like Taslima’s, allowing workers who fall ill to take the paid sick leave they are guaranteed by law. As the first small group of workers walked out of the factory, many of their co-workers joined them, and as word spread in the days that followed, workers from as many as 40 other factories took to the streets in a series of wildcat strikes. The retaliation was swift and severe, led by factory owners who are members of the powerful trade association, the Bangladesh Garment Manufacturers and Exporters Association and the Ashulia police. Within 10 days, the strike was over, 85 factories were shuttered—most of which had not been involved in the strike—and, according to a consortium of human rights groups, at least 1,500 workers were fired or forced to resign. Most of them are now having trouble finding work in Ashulia, according to labor activist Kalpona Akter of the Bangladesh Center for Worker Solidarity, and believe that they have been blacklisted. Owners of eight factories, including Windy Apparels, filed criminal complaints against labor leaders with the Ashulia police, accusing them of vandalism, looting, and assault—despite scant evidence of any violence during the protests. One television journalist, Nazmul Huda, was arrested for his coverage of the strike, charged with inciting the unrest and spreading false information. The factories reopened in late December, but a “really intense” security presence is everywhere, Jennifer Kuhlman from the Dhaka office of the Solidarity Center, an international affiliate of the AFL-CIO, told me: not just in Ashulia, but also in other industrial areas across the country. She said the arrests, the mass firings, and the continuing heavy surveillance by police have created a climate of fear among workers and labor organizers. Akter, from the Bangladesh Center for Worker Solidarity, told me by phone that the group’s Ashulia office was shut down last month and that one of her organizers, Mohamed Ibrahim, who is among those arrested, reported having been blindfolded and subjected to death threats while in police custody. She herself had to go into hiding for two weeks, she said, fearing that she too might be arrested. She said the crackdown has had a chilling effect on organizing and it’s become even harder than it was before to address workers’ concerns. The only intervention that could make a difference now, she told me, is for brands to step in and demand that their suppliers drop all charges and reinstate the fired workers. The eight factories that filed criminal complaints, according to data compiled by Workers Rights Consortium, make clothing for dozens of global brands, including H&M, Gap Inc. (the parent company of Gap, Banana Republic, Athleta, and Old Navy), the VF Corporation (parent of North Face, Jansport, Vans, and Eagle Creek), Walmart, and Inditex (which owns Zara). Six of the eight factories are suppliers for H&M, which has a global framework agreement with the unions IndustriALL and IF Metall to support factory-level unions within its supply chains. This post originally appeared at the Investigative Fund.